The cloud mining company Genesis Mining is going to be adding a new alternative crypto coin to the list of coins you can mine with the cloud hashrate you can purchase from them. 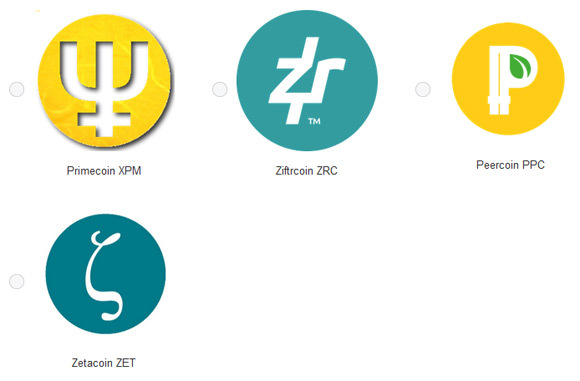 After a survey among the company’s customers to see what are the most wanted coins to be added, the list was shortened to just 4 crypto coins – Ziftrcoin (ZRC), Peercoin (PPC), Primecoin (XPM) and Zetacoin (ZET). Out of these four two are using SHA-256 – Zetacoin and Peercoin, so you should be able to mine them directly and the two others – Ziftrcoin and Primecoin are using different algorithms, so you will be able to get paid in them if any of them gets chosen as the new addition. So we come to the point where you can vote in a poll to choose the coin you want from the four top choices and get the chance to win some cloud mining hashrate. Three people from all who vote will be getting 500 GHS lifetime cloud mining hashrate each at the service (the winner will be picked randomly). All you have to do is cast your vote in the special poll at the official Facebook page of Genesis Mining and you have until Friday May 22, 2015 at 11 pm CET to do so. GPU mining of Primecoin (XPM) seems to be growing, however the problem with pools for mining XPM still remains and most of the GPU miners available are either for solo mining or for mining XPM only at ypool. This could soon change as the user madMAx510510 over at the Bitcointalk forum has released an open source Primecoin (XPM) GPU miner and a Pool, so hopefully we are soon probably going to get more pools and options to mine the coin with GPU. 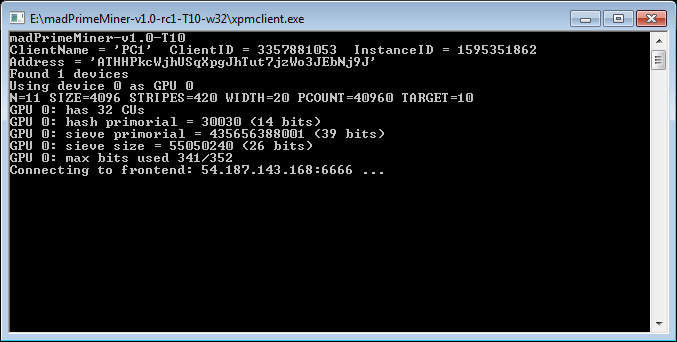 Primecoin XPM GPU Miner for xpmpool (aka. madPrimeMiner) uses Google protobuf protocol that is only compatible with the Primecoin XPM Pool Server, so pool operators may easily add XPM mining pools using these two as a base if they are interested. 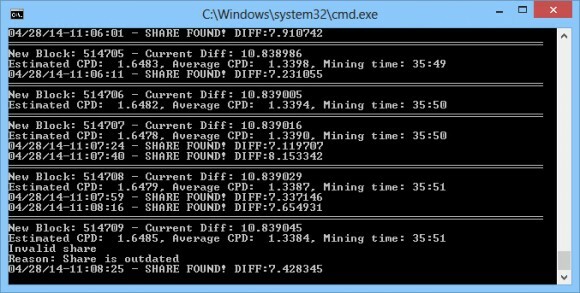 Primecoin (XPM) was one of the crypto currencies that was able to hold the front for no GPU miners for quite some time and it was only mineable with CPU however for a few weeks already it is possible to mine it with GPU as well. The first GPU miner “available” was Primegpu, supporting only solo mining and requiring the users to buy a license for the miner at 25 XPM per GPU it dd not seem very reasonable thing to do, so we have skipped it. The good thing is that there is already a new open source project that supports GPU mining, so far only solo mining, that may not be the fastest solution, but available for free, so you can test it yourself. The third GPU miner available is called Claymore XPM GPU Miner and this one has two versions, one for solo and one for pool mining with support for ypool.net, this is the miner we have been testing the last few days. Do note that this miner has a 10% developer fee that goes to the author of the project in order to keep him motivated to develop it even further and we consider this approach to be the much better choice than to have to pay for a license. The only drawback is that the miner is only available for Windows. If you are wondering what version to use, then you should consider what is the number of GPUs that you have available and want to throw at mining XPM. If you are using one or two GPUs then you probably will be better off using the pool version at ypool as it should give you more constant earnings. If you are going to be using more and more powerful GPUs you may try solo mining, it has higher risk, but can also bring you much better profitability. We have tested the miner with a single Radeon R9 280X GPU at the ypool in order to see what we can expect to get for 24 hours and we ran the test for 48 hours. The reason for that is due to ypool’s way of calculating share value – it is accumulated for the last 160 rounds, so you start with lower earnings per block and after 160 rounds you can get a better estimate on per round earnings you are going to be getting if you continue mining. This way the first 24 hours will bring you less mined XPM coins than what you will get in the next 24 hours and after that, so give it a bit more time in order to see what profitability is going to be just like we did. So it seems that GPU mining for Primecoin (XPM) can offer a nice boost in terms of profitability over direct LTC mining for the moment. And with some good luck and ore GPUs you might be lucky enough to get close to double the direct LTC mining profitability. Solo mining with more GPUs could also prove to be a good thing to try, but as we’ve said the luck there plays a much bigger role, and the higher the risk, the higher the chances for even better profitability as well. Solo mining is not recommended for a single or two GPUs as there the risk is much higher as it may take significantly more time to find a block and you may give up early and loose some precious mining time ending up with nothing.